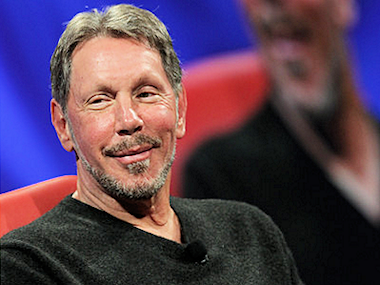 In the history of Silicon Valley, there are few characters more colorful than Larry Ellison. The CEO and founder of the enterprise software giant Oracle rarely needs an introduction, and in certain circles he is often referred to by his first name alone — with no doubt as to whom you’re referring. He’s also known for racing sailboats and flying planes. Today, he’s onstage for an interview with Kara Swisher at D: All Things Digital. Ellison is also known for his enemies, both in the marketplace and in the courtroom. Oracle is a dominant force in the enterprise software business, and competes strenuously against other giants like SAP, but it has also hauled its executives into the courtroom over the theft of software. Newer enemies are Hewlett-Packard, once a significant partner; and Google, against which Oracle recently lost a lawsuit alleging patent infringement. Expect lots of questions about the lawsuits. There’s also the matter of Oracle’s new enterprise hardware business. Oracle, traditionally a software company, bought Sun Microsystems and thus has a new — or some would say old — hardware business. No doubt he’ll have a lot to say about whether or not that’s been a good purchase. The jury is still out. Finally, Ellison is also known for his friends, and one in particular: Apple founder and CEO Steve Jobs. After the interview, Ellison will participate on a panel we are doing as a tribute to his close friend. 4:27 pm: Kara: This is the interview I’m most excited about. Let’s start with the America’s Cup. Larry: It’s the oldest trophy in international sports. Dates to 1851. Back in the 1850s, when you moved products around, it was by sailing ship. The Queen of England organized it. Schooner America from the U.S. challenged the Brits. They raced around the Isle of Wight. Americans won the first one. Since that time, six American teams have won the cup. It’s the most difficult trophy to win. I tried three times, and won once. I’m defending in San Francisco next year. There are lots of teams to beat, but we’ll be competitive. It’s extreme sailing — this is not the kind of boat you’d use to take your kids to sail. Even the small boats go 40 miles per hour. They are designed to be unstable so they go fast. It can be dangerous. Every time I’m on one of these boats, there’s some kind of injury. Kara: You’ve been CEO of Oracle since 1977. You’re probably the longest-running tech CEO in Silicon Valley. Let’s talk about the sweep. Where do you think Silicon Valley is now? Do you still think innovation is mature? Larry: I think the Internet was the last big change. The Internet is maturing. They don’t call it the Internet anymore. They call it cloud computing. Larry: When the Internet first started, the primary device connected to it was the personal computer. Every network has enormously complex components that are hidden from consumers. The PC network was very different. The PC was very complex, and was attached to a complex network. Now we’ve migrated that complexity off the desktop and moved it to Internet servers. That has been recast as cloud computing. Kara: Why did you resist the name “cloud computing”? Larry: I like the words. It’s a charismatic brand. And people do need to simplify their existing data centers and deliver services in simpler ways. Kara: How do you look at innovation in Silicon Valley? Larry: The big thing was the Internet. Right now, our daily lives are on the Internet or the social network. For a very long time, we’ve known how much you earn, what clothes you recently bought, because we had your credit records. That was the single most important database in the world. It tracked every consumer and everything they were doing. Now we can track not only what you’re buying, but what you’re saying about them. We know who your friends are, and what you’re saying to your friends. We suddenly have consumers instrumented, because they are willing to share their information. Consumers just tell us everything about themselves. Every time you make a comment or tweet, all of this stuff, we have all this detail of people’s lives online, which allows us to market things and sell things and service the consumers in a more insightful way. Larry: I am on Facebook, but I don’t use it much. I was obsessed with it for three months. Making friends. Meeting people I would otherwise never meet. Finding out what they had for breakfast. Kara: What did you say to Mark Zuckerberg when you met him? Larry: I told him I thought Facebook was a world-changing technology. Google is a very important company. Facebook is arguably an even more important company. How they monetize all of it remains to be seen. Kara: Did you also look at Buddy Media? Larry: We did. But we looked at other companies as well. And we bought the one we wanted. 4:45 pm: Larry: If you don’t keep your technology current, you’re going to lose your customers to a competitor. For every Facebook, there’s also a Splunk or other companies doing interesting things. Kara: Are there areas that are more hyped than others? Larry: I thought cloud computing was overly hyped and very promising at the same time. Larry: People said the PC would replace the mainframe. But IBM still does mainframes. PCs are more important than mainframes. I would argue that smartphones are more important than PCs. For the first time, the consumer end of IT is bigger than the enterprise side. Consumer information processing is the biggest part of our business. Kara: So are you a consumer company? Larry: We’re not a consumer company, but we sell to the consumer companies. Apple is a big customer. And all the phone companies — we are by far the most popular provider of automation systems all over the world. Our big competitor there is IBM, and we’re growing much faster than they are. IBM used to be No. 1 in database; now we’re No. 1. They used to be No. 1 in middleware, and we’re now No. 1 in middleware. They’re No. 1 in high-end servers; soon we’re going to be No. 1 in high-end servers. Kara: What do you do all day? Larry: I still run engineering at Oracle. Mark Hurd runs the sales and consulting, and Safra Catz runs accounting and legal. What I do every day is look at product plans. 4:50 pm: Larry: Long before we bought Sun, we decided to build this database machine. We thought data centers were unnecessarily complex. People were buying storage from EMC, and networks from Cisco, and all these other separate parts together. I said let’s do all of it. We’ll sell one building block you can plug into your data center. We’re trying to do for the data center what Apple did for the consumer. 4:52 pm: Larry: Sun has already paid for itself. Sales are going down in hardware, but the unprofitable part is going away. Our margins are the highest of anyone in the server business. The sales are down 20 percent, but the profits are up. Larry: If you look at the iPhone, 90 percent of the complexity is the software. And the chips. We design the chips in the Sun servers, the SPARC chip. The complexity is in the software. Larry: We’re announcing the general availability of the Oracle Cloud. Platform as a Service. Database Service, Java Service and a bunch of applications. All on top of other acquisitions, like Taleo for talent management. Larry: A complex ERP and HR suite in the cloud. All running on Oracle hardware, and running in their own virtual machine. Kara: Talk about your patent situation, the recent cases with Google, HP and SAP? Larry: They’re all being litigated. Google is really a copyright case. Larry: We won on infringement. (Sorta.) When litigation is over, I’ll talk about it. On the HP case: HP sued us when we hired Mark Hurd. Then they sued us when we said we wouldn’t port new versions of our software to Itanium. That is the next version of our database, which comes out next year. HP says we have a contractual obligation to port to Itanium. We don’t think that is true. Kara: Do you imagine a better relationship with HP? Larry: Now that Meg Whitman is CEO. I like Meg. He doesn’t like the former CEO, Léo Apotheker, formerly of SAP. Larry: SAP admitted to stealing Oracle software. Who was CEO of SAP when that happened? Leo. Larry: I’m not going to call him Léo. Leo. You’re going to fire Mark Hurd and hire Leo? Kara: So you get along better with Meg? Larry: I wish Meg nothing but the best. I wish her nothing but the best. Those of us who grew up in the Valley think of Hewlett and Packard as role models, and we’d like to be half as good as they were. Then they brought in Leo. Then when we subpeonaed him, he went on the lam! 5:00 pm: Larry: They sent him to Bolivia to talk to customers. And then they sent him to Mongolia to talk to customers, just beyond the reach of the federal subpoena. They should have left him in Mongolia, because when he got to California, it got bad. 5:01 pm: Kara: What do you think HP should do? Larry: You want me to give HP advice? I think Meg was a big improvement. But I’m focused on running Oracle. I like her, and I hope she does well — for the benefit of HP’s customers and employees. Kara: What keeps you going? Larry: Red Bull. Kidding. Life’s a journey. We’re all curious about each other and about ourselves. It’s a journey about discovering limits. I’m fascinated by what can be done with technology. To constantly test limits. Learning as we compete to solve customer problems. The whole thing is just fascinating. I don’t know what I would do if I retired. When I go sailing, I look around to see if anyone wants to race. I just like competing. Kara: What’s one thing people don’t know about you? Larry: That I play classical guitar. Kara: Is the public’s image of you accurate? Larry: Frequently, I’ll be in a meeting with someone and the person says “Oh my God, you’re nothing like what I thought you’d be.” Of course, it’s a low bar. I didn’t just bite the head off a small animal before the meeting. 5:04 pm: Now time for Q&A. Question about what is the next mountain for Oracle to climb. Is the consumer cloud holding something for you? Larry: We are not competing with IBM in services. As services becomes more important for IBM, products are the tail and service is the dog. We think we can beat IBM in servers. That is the next thing for us. Exadata, Exalytics, Exalogic. Our other big competitor is SAP. The interesting thing about them is that while we’re rewriting all our big applications, SAP hasn’t even begun to rewrite their applications. Larry: SAP’s franchise in ERP (enterprise resource planning) is in danger. They announced they will have nothing new until 2020. They are buying Ariba, and they bought SuccessFactors. SAP’s business is ERP and they have nothing new in the cloud for at least eight years and I’d argue nothing for 10 to 12 years. Question about Workday, a company run by PeopleSoft founder Aneel Bhusri, who is in the audience. Larry: It’s going to be very interesting to monitor Workday. We monitor Workday, and we beat Workday all the time. Workday doesn’t use a database. They use Flash as a user interface, so they can’t run on iPhones or iPads. Whenever we’re in a head-to-head with Workday, we almost always win, and that’s before we’re fully launched. (He’s really hating on Workday. Interesting.) Salesforce uses a really good database. They use Oracle. And great middleware. They use Oracle. Question about America’s Cup. What is it about this event for guys like you? And what do I have to do to get to sail with you? Larry: I had a boat called Sayonara. I drove it to five consecutive championships. So it was the logical next step. I have been a competitive sailor for a very long time. I decided to find out how good this Russell Coutts guy is. Answer is, he’s really good. 5:12 pm: Question from Esther Dyson about Larry’s philanthropic efforts. Larry: We have a foundation, the Ellison Medical Foundation, that is focused on diseases related to aging. For obvious reasons. (Jokingly referring to himself.) We do primary and applied research. I’ve spent about $1 billion supporting that. Oracle has a very large health-sciences practice. 5:13 pm: Larry: We recently started a company where we are simulating quantum mechanics in small molecules, where we are doing drug design. Basically building chemical simulators so we can test drugs. It’s something that has fascinated me my entire life. Biological systems are very complex, and every year we understand them better. 5:15 pm Question: Any advice for Obama? Larry: My advice to Obama is that we have to have a more balanced immigration policy. (Applause.) Immigration is a good thing. We need to embrace people with skills not readily available in the U.S. We need to embrace scientists and mathematicians and doctors trained in the U.S to stay in the U.S., rather than sending them back to China or Indonesia and have them buy houses there and start their companies over there. It is simply madness that after we grant someone a degree from Stanford that next they get a note from the government to get out. 5:18 pm: Kara: We have to end it there, because we’re going to the panel on Steve Jobs. That’s it for now.